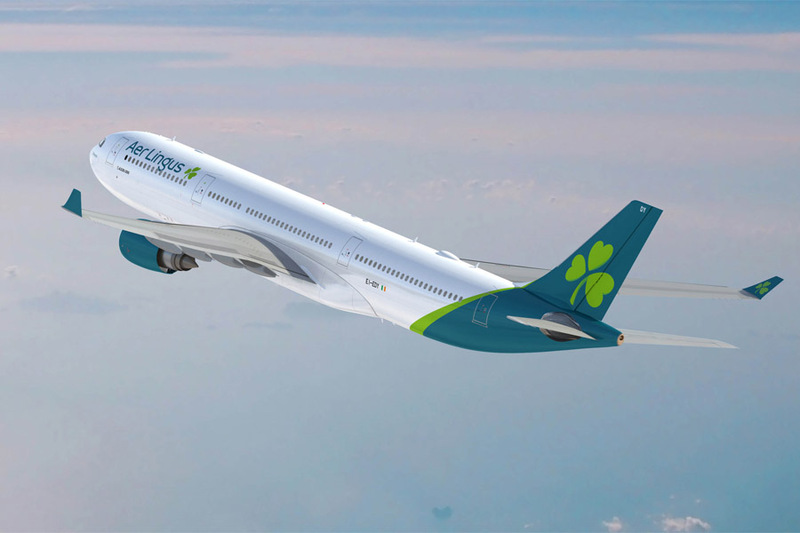 With the first of 14 A321LR aircraft due for arrival very soon – which will see the launch of US flights using single-aisle planes – Aer Lingus has announced its new first brand refresh for over 20 years. I did find the old Aer Lingus livery a little old fashioned so I do welcome this change. Like Emirates, Aer Lingus has decided to paint its undercarriages in a bright colour – in this case teal – in order to stand out to people who see the aircraft flying overhead. There are currently two aircraft completed, one A330 and one A320, with the rest to follow over time. Apparently it takes 10 days to paint a widebody long-haul aircraft and 7-8 days to paint a narrow body short-haul aircraft. The A320 is due to visit Heathrow next Monday for the first time so look out for it if you are travelling. You can find out more, including a video, on this page of the Aer Lingus website. PS. By 2023 Aer Lingus states that it will have 30 aircraft flying on North American routes, up from 17 today. If you thought Aer Lingus had already built a substantial network, we clearly haven’t seen anything yet. Given the decent flat bed Business Class seating and the ability to clear immigration in Dublin and Shannon, I hope they succeed. This is our warm review of Aer Lingus A330 business class. Another airline falls for dull, boring white …. shame. A lilt or a wilt…..? I have had bad experiences of Aer Lingus staff and cancellations at a whim on routes to the UK ex DUB, so I will not be using them. I cannot incorporate into plans, such unreliable service, reminiscent of Aeroflot years ago. Good luck to Willie and his “sham”rocks! OT I understand that within a couple of hours of the Flybe annexation by the Virgin consortium, they had resold all the Flybe LGW slots to Vueling, which if true is an interesting twist. Also, if true, its a shame that Rob did not put his money where his mouth was about seeking his HfP mates backing for the take over; it turned a staggering profit on the slot sale in hours! A bankers’ dream!! Never mind, there’ll be another one along in a while – Norwegian, and then possibly Vueling…where did they get the money to buy the slots?? They committed millions to prop up a failing business in addition to the sum to be paid for the shares. There is no profit. Yet. If those assets didn’t have debt assigned to them I would assume the business would have gone for far more. Planes can be leased, or on HP, buildings can be mortgaged etc. Can’t be bothered to read the financials but it’s not out of the realms of possibility that those £4.5m slots had, for example, a £3m loan secured against them. Point being, one simply cant read a single number and determine profit. If that is true is there any suspicion held by anyone that the slot sale to Burlington could in any way have contributed to the lack of a competing offer from IAG? Where did they get the money from? Vueling made around £20M in profit and brought slots for £4.5M – IAG which owns Vueling made a profit of 600M€ I wouldn’t be holding my breath for this purchase to break Vueling anytime soon. New Alicante service already announced by Vueling to start in April from Gatwick. Flybe had already sold them before the deal was completed as not needed due to the transfer of the flight to LHR so nothing to do with Virgin. They’ve also launched a new credit card – the first airline credit card on the Irish market that I’m aware of! Wow … I am stunned. And not a Diners card in sight! Do you have another link? It would appear they put the info up prematurely. When you try to access it now the link won’t work. The main details were a monthly fee of €7.99, earn1 Avios per €1 on Aer Lingus and 1 Avios per €4 on all other spend. No sign up or spend bonus but you would get 2 ‘free’ European flights (when you pay taxes and charges) 2 lounge passes for DUB/ORK/SNN, 2 passes for fast track security after you spend €5,000. It also included free annual multi trip travel insurance. Seriously useless.. no bonus. None of us on this forum can cope with that parsimony. My friends in Ireland are so frustrated by the lack of avios collecting opportunities. I like the new look but the marketing hyperbole that comes with it always makes me laugh! +1 Were they not daring enough to make it a 4-leaf clover? Any idea how much these identity changes cost? Do they wait until a plane actually needs to be repainted, or do they waste extra money on replacing perfectly serviceable paint? Of course they waste extra money. Plus they pay people to write the sort of marketing drivel Rob showed above. do you remember the British Airways weird designs tailfin disaster? I think that meant they painted, and painted again, within a very short period. That must have cost them a lot when they eventually listened to feedback and changed it. But all were far better than the ghastly Britannia design, which was maybe appropriate for Imperial Airways, but not the 1980s. And, of course, Margaret Thatcher hated the change from Britannia, which only confirmed my feelings that I was right in liking them. I commented yesterday that the white was a bit retro, and 24 hours later, still don’t think it’s a great choice. But the rebrand is said to be costing around €2 million, which is surprisingly little. An American consultancy – https://lippincott.com – is responsible, and personally I think they did a better job for most of their other clients, including Delta and Starbucks. Why on earth did Air Canada ditch its distinctive and unique teal all-over in favour of absolutely uneventful livery? Any ideas? Aer Lingus have flown single-aisle planes to the US for decades – they flew 757s for many years between Ireland and the East Coast US. In fact, they still do today – they run 757s on flights to Toronto and on seasonal SNN-JFK and SNN-BOS routes. I’ve always done A330. When I did my Dublin-Toronto (Did that route 4 times to 2 from Toronto and 2 from Dublin). I’ve never gotten 757 and always see A330 on flight radar. I like the older livery much better. Not a big fan of the older one. It looks pretty ugly imo.